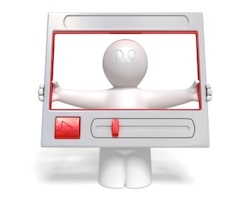 One great way to promote your business online is through the use of videos. According to Compete, YouTube is the 4th most-visited site online and receives the second highest number of keyword searches after Google. This post by Maureen Page, VP of Discount Security Cameras, your source for quality security camera systems, looks at how to use videos to promote your business. And to learn more about Maureen or security camera systems and video surveillance visit the Discount Security Cameras Interactive Security Camera Learning Center. Take it away, Maureen. In our connected and online world, it is getting increasingly difficult for small business owners to get noticed in the crowded online landscape. Long gone are the days of getting a phone book listing and print advertising. But even for those businesses with a good, robust, online presence, getting noticed can be quite a challenge. One way to rise above the crowd is to use video to help promote your business. Video can be used to promote products and services, give instruction or provide training, or to provide customer testimonials and case studies. This article will outline a process for using video that not only gets your business noticed, but also helps drive traffic and potential customers to your website. Without getting into the mechanics of filming the videos, it is important to understand some general guidelines for your videos. Videos not video. You should think of this as creating a number of videos or a video series. When creating a video series, the end of one video in the series should promote the next video in the series. Interesting and engaging content. Your videos should not simply be a commercial for your business, but should be something of value that people will want to watch because they will learn something. Be mindful of the time. Videos should not be too long – on the order of only 5 to 10 minutes in duration, or you will lose your audience. If a topic requires more time, break it into a series of shorter videos. For example, for our business we created an Introduction to Security Camera Systems video series. In this, we take a relatively involved topic, and break it into a series of short videos on various sub-topics. The main promotion of our business is in the lead-in and ending graphics of the video where we promote the name of our business and our learning center’s web address. The rest is purely instructional. There is more to promoting your videos than simply slapping them up on YouTube. In fact, you do not want to put all of your videos up on YouTube. Yes, you read correctly, you do not want to put all of your videos up on YouTube. If you put all of your videos up on YouTube, all of the views and all of the traffic will go to YouTube and little or no traffic will actually go to your own web site. Since your goal is to promote your own business and not YouTube, this would be a less than desirable outcome. A much more effective approach is to place the first couple of videos in the series up on YouTube, also placing them on your own website using the YouTube code so that you get credit for views. All subsequent videos should simply be put on your website. It is important, as has already been mentioned, that the end of each video promote the next video in the series. Thus, the last video in the series posted on YouTube would promote the continuation of the series on your website. For example, when we created the previously mentioned Introduction to Security Camera Systems video series, we placed the first two videos on YouTube as well as on or Interactive Learning Center. The second one in the series on the YouTube site promotes the third video in the series on our own site. In doing so, we are trying to funnel visitors who were introduced to our content on YouTube to our own web site where we have more of a chance of turning them into a customer. The next step is to make sure that Google knows about your videos so that your videos can appear in video search results. To help this process along you should create a video sitemap. A video sitemap is a structured file that tells search engines about your videos. While this may sound daunting, there are tools out there that can help. A search of video sitemap generator will uncover several options that can help you to create a video sitemap. We use a WordPress plugin, FLV Embed, that automatically generates our video sitemap. Once created, the sitemap should be submitted to Google Webmaster Tools so that Google “knows” about your video content (also see Submitting a Video Sitemap or mRSS feed). You will need a Google login to submit to Google Webmaster Tools. Following these steps can have many positive outcomes. Your videos can now appear in video results in Google blended search results. In addition, people can discover your videos on Google Videos. All of this gives web searchers more ways of learning about your company and your products and services. This can also help drive more traffic to your site bringing you more potential customers. A well executed video section on a site can also attract links, which only improves how your site will perform in search results, potentially resulting in even more traffic and potential customers.